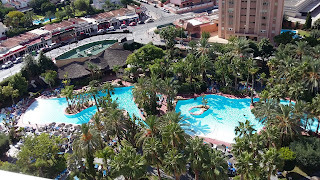 We went on holiday to Benidorm and the internet there wasn't great so I didn't take my laptop, hence the lack of updates and reviews on here. I did manage to read seven books though, one being over 600 pages and my workie had been on at me for ages to read, "The Given Day" by Dennis Lehane (author of Shutter Island). That book was rather brutal in some of its content, racism, and I think one that will stay with me. I hope to catch up on my reviews over the next few days however I have a mix of days and nightshifts at work and heading to Liverpool at the weekend for Horrorcon with a friend! So, home from holiday and a fair bit of post. However I absolutely have to share my fav with you. I won a competition before I went away on author C L Taylors Facebook page. I won a pen and a usb stick, I absolutely love usb sticks and when I opened the parcel I thought oh, they have only sent me a pen. 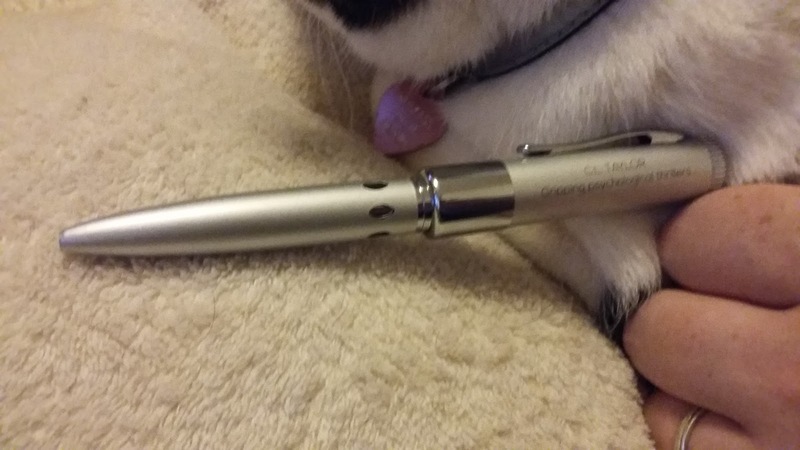 However, the pen is actually a pen AND a usb stick, how awesome is that! If you are an uber geek and love gadgets like me then you will appreciate my delight. So I decided I would do a wee post to show the fabulous post, plus it has been a week since I shared any pictures of Princess so I figured you want one of her too. And I will do a wee giveaway too as it is nice to give something back don't you think? 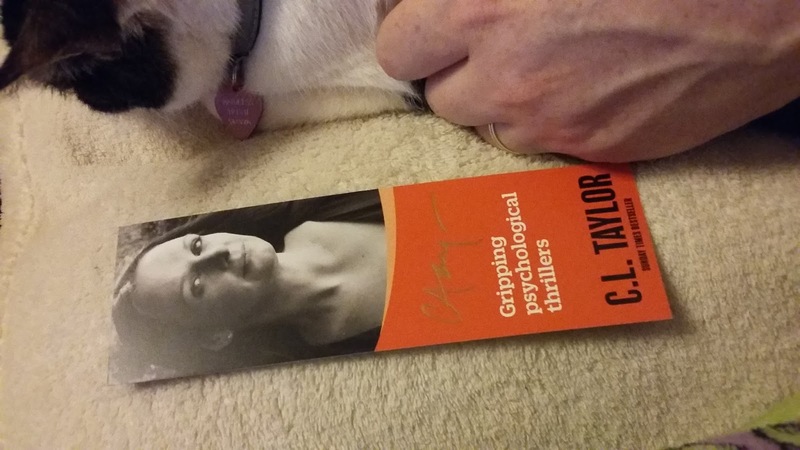 I also got a fabulous signed bookmark. 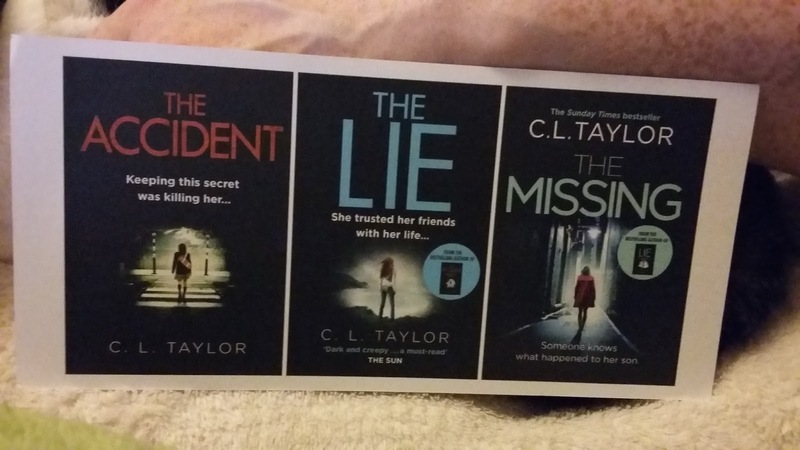 I also got a wee postcard with the previous book covers, if you haven't read them and you like psychological thrillers you really need to check them out. So, celebrating my wee win and to highlight an author who deserves it I am doing a wee giveaway for an Amazon voucher for one of C L Taylors books. Her new YA one, out in October is pre - order but can be chosen if the winner so wishes. 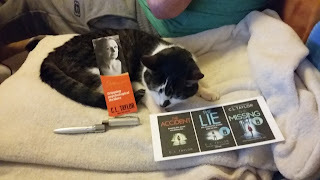 The winner will pick the ebook they would like to win and I will send the voucher for it. To be in with a chance of winning just use the Rafflecopter below to enter. The more entries you complete the more times your name goes in, open worldwide, you DO need an Amazon account as the voucher is for Amazon. A new to me author. THE MISSING caught my attention. Thank you. I have read them all, I'd say the accident is my favourite. I'd choose the treatment as my win if I was lucky as its only one I haven't read.